Blacks, both slave and free, help to found this oldest town in the United States. In 1693 Spain offers freedom in Florida to slaves who convert to Catholicism. Until 1763, these freed slaves live in a community northeast of St. Augustine. Gracia Real de Santa Teresa de Mose, or Fort Mose, established in 1738, thus becomes the first free black town in the United States. Governor Don Felipe de Neve recruits 11 families to settle on the Porciuncula River--now Los Angeles. The settlers are all Catholic, a mix of Africans, Spanish, and American Indians. Meanwhile, Maryland's black Catholic population grows to 3,000 as a result of Jesuit evangelization in the region. A handful of women from Baltimore's Haitian refugee colony begin to educate local children in their homes. With the support of the archbishop, in 1829 they create the Oblate Sisters of Providence. The first superior is Elizabeth Lange, born in Cuba of Haitian parents. A later archbishop dismisses the need for an order of black religious, but the sisters find new advocates among the Redemptorists and in Saint John Neumann, then archbishop of Philadelphia. Their ministry spreads to Philadelphia and New Orleans. In this 1839 apostolic letter, Pope Gregory XVI condemns the slave trade as the "inhuman traffic in Negroes." Rome outshines the U.S. in race relations from the 17th to 20th centuries. Many U.S. bishops as well as men's and women's religious orders in this period own slaves, sometimes advocating for their proper treatment. Bishop John England of Charleston, South Carolina defends the American domestic slave trade, arguing that Pope Gregory's apostolic letter refers only to slaves imported by the Spanish and Portuguese. Though claiming he is not personally in favor of slavery, he says it was a "question for the legislature and not for me." Founded by Henriette Delille and Juliette Gaudin in New Orleans, the Sisters of the Holy Family become the second religious order for black women. Biracial and of African descent, the founders are free people of color, at that time a separate class and culture above the slaves. The order ministers to poor blacks, educating and tending the sick. 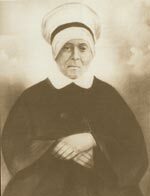 This follows an earlier attempt by Frenchwoman Marie Aliquot to start the Sisters of the Presentation, soon dissolved for violating Louisiana's segregation laws because the white Aliquot sought black women to join her. Aliquot is not allowed to join the new Sisters of the Holy Family because she is white. During an outbreak of yellow fever, the nuns heroically nurse the sick and are thus granted public recognition. But they are not allowed to wear their habit in public until 1872. Arriving in New York from Haiti in 1787 with his owner, Jean Bªrard, Pierre Toussaint is apprenticed to a New York hairdresser. He becomes a friend to the city's aristocracy by dressing the hair of wealthy women. When Bªrard dies penniless, Toussaint financially supports Bªrard's wife, nursing her through emotional and physical ailments. She grants him his freedom in 1807. His stable income allows him to buy freedom for his sister and his future wife, and to be generous with many individuals and charities, including an orphanage and school for black children. He cares for the ill when yellow fever sweeps the city and opens his home to homeless youth, teaching them violin and paying for their schooling. A case for his beatification has since been opened in Rome. 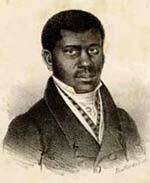 He would be the first black American saint. Although James Healy and his nine siblings--all fathered by a Georgia plantation owner--are officially slaves, their father brings them north for education and freedom. Three of the Healy brothers--James, Patrick, and Alexander--become the first African American priests in the U.S., although they do not identify with being black and never speak out on behalf of blacks. Bishop John Fitzpatrick of Boston, a friend of their father, encourages the boys to attend Holy Cross College in Worcester, Massachusetts. James studies for the priesthood in Paris and is ordained bishop of Portland, Maine in 1875. His brother, Patrick Francis Healy, a Jesuit who conceals his African origins for much of his career, becomes president of George-town University in 1874 (ironic because Georgetown admitted no black students until the mid-1900s). James would not ally himself with black Catholic leaders nor agree to address meetings of black Catholics, once citing Saint Paul's admonition that there shall be no Greek nor Jew in Christ. In January 1889 almost 100 black Catholic men meet with President Grover Cleveland on the last day of the first black Catholic lay congress in U.S. history. Daniel Rudd, a journalist from Ohio and founder of the American Catholic Tribune, becomes a leader of black laity. Fiercely proud of the Catholic Church, Rudd claims the church is the one place of hope for black people. Rudd recruits delegates to the first Black Catholic Congress, hoping to "let them exchange views on questions affecting their race; then uniting on a course of action, behind which would stand the majestic Church of Christ." The delegates' statement calls for Catholic schools for black children, endorses temperance, appeals to labor unions to admit blacks, advocates better housing, and praises religious orders for aiding blacks. Rudd also helps organize the first lay Catholic congress of the entire U.S. in 1889, where he insists that blacks be treated as part of the whole, not as a special category. At the fourth Black Catholic Congress in 1893, Charles Butler decries prejudice and discrimination within the Catholic Church, asking, "How long, O Lord, are we to endure this hardship in the house of our friends?" The congress calls attention to the church's failure in its mission "to raise up the downtrodden and to rebuke the proud." Thus black Catholics made the social implications of Catholicism into a primary feature of the faith, a new and bold approach for the time. The fraternity of the Knights of Peter Claver is established by the work of Josephite priests as a parallel to the Knights of Columbus. It soon develops chapters for women and young people. Led by Thomas Wyatt Turner, the Committee for the Advancement of Colored Catholics forms during World War I to care for black Catholic sevicemen, neglected by both the Knights of Columbus and the black YMCA. After the war, the group broadens its focus. Its advocacy gives birth to a new national forum for black Catholics. Its purpose: "Collection of data concerning colored Catholics, the protection of their interests, the promotion of their welfare, and the propagation of the faith among colored people." The U.S. bishops, despite requests from Rome to act on behalf of blacks during the race riots and lynchings of 1919, avoid the topic at their first annual meeting. In response, the committee publicly urges the bishops to denounce discrimination and consult with black Catholics, saying, "at present we are neither a part of the colored world (Protestant), nor are we generally treated as full-fledged Catholics." The Georgia state legislature introduces a bill prohibiting whites from teaching black students. Although the law eventually fails, a community of black sisters is formed to teach. In 1922 the sisters relocate to New York where they start a soup kitchen and begin educating local children. In 1929 they affiliate with the Franciscan Third Order, becoming the Franciscan Handmaids of the Most Pure Heart of Mary. Still active in Harlem, their ministries have spread elsewhere in the United States. The Society of the Divine Word in Greenville, Mississippi, with the blessing of Pope Benedict XV, opens St. Augustine's, the first seminary for blacks. Some American bishops are still not convinced of the merit of a black priesthood. American bishops denounce racial prejudice as immoral for the first time. 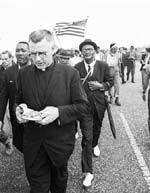 Many Catholic clergy and women religious join the march in Selma, Alabama, marking the church's foray into the civil rights struggle for racial equality. Prior to the meeting of the Catholic Clergy Conference on the Interracial Apostolate in 1968, Father Herman Porter of the Rockford, Illinois diocese invites all U.S. black Catholic clergy to a special caucus. More than 60 black clergy gather to discuss the racial crisis and decide to form a permanent organization. They send a statement to the bishops strongly criticizing the church but clear in its expression of their devotion and hope. It lists nine demands for the church to be faithful in its mission to blacks and to restore the church within the black community. The caucus remains active today. The National Black Catholic Congress is re-established in 1985 as a coalition of black Catholic organizations. In 1987, NBCC renews the tradition of gathering black Catholics from across the country. The first renewed congress, Congress VI (the first five took place in the 1800s), takes place in May of 1987 in Washington, D.C. NBCC holds a national congress every five years, and each event attracts growing numbers of attendees. Congress IX is August 29-September 1 in Chicago.